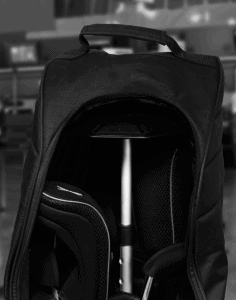 You might think golf bags are all the same. 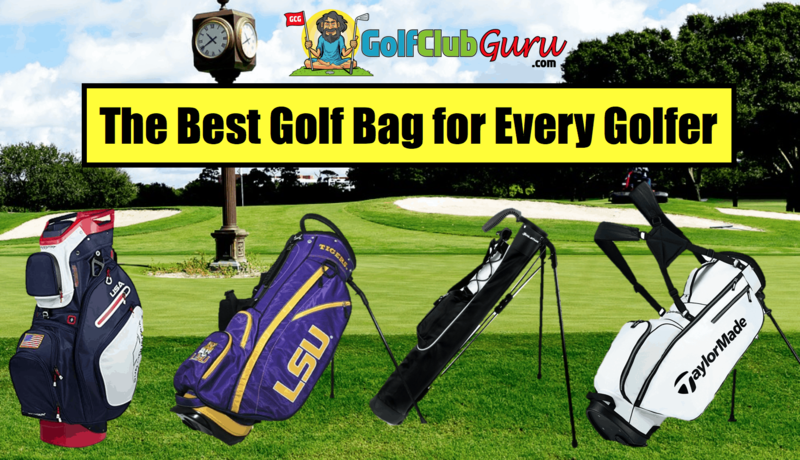 You might think searching for the “best” golf bag is a waste of time. Just kidding, you probably don’t think that, because you somehow ended up on this article after searching Google for the best golf bag you can buy. If you are like me, my first golf bag was one that was handed down from my dad. The first few rounds that we played were great! I would lug that big thing to the cart before we teed off and back to the car when we were done. Problem was, after the first few times, I stopped riding and started walking after buying a membership that didn’t include cart fees. It only took a few holes for me to realize this relationship was not going to work. I had to find a lighter, small golf bag – and it had to have the backpack straps instead of the single strap that caused my back to permanently lean to the right. If you don’t need to carry many things around, there is no use in getting a large bag! I’ve personally played with what is called a Sunday golf carry bag (imagine the smallest golf bag ever), and it was plenty for me. Other people, however, need to carry a ton of things around. You might need more than a dozen golf balls (sorry, not sorry), all of your training aids, extra clothes, an umbrella, etc. For you, I would make sure you are getting a bag that will be able to hold everything you need. Like any product you will ever buy, you can buy cheap (which might break, leading to you having to spend more money to fix it or buy another one) or you can buy the most expensive product that is typically the best quality. Or, like I like to do, you can do enough research and filter through enough reviews to find the best budget or best value golf bag on the market. To make this article as helpful as possible, I will try to break down the best golf bag for many different groups. You might fit into many of them, so pick what is most important to you. If you have any questions, please leave them in a comment below! At just 4.5 lbs, this bag is perfect for anyone that typically walks when they play. It has plenty of compartments for everything you might need to carry. On top of that, you know that by sticking with a top brand in golf, you will be getting well made product that will last a long time. Selling for a round $100 at the time of this writing, it is a great bag on a budget as well. It is one of the most popular bags ever sold on Amazon, and for good reason. Although I do not own this bag personally, if I needed a new one this is the one I would get. The reviews speak for themselves, and I really like the different colors that are available. I know, I am a little basic, but the black bag with white letters is my personal pick, as it won’t show when it gets dirty from some messy rounds. Four and a half pounds is a super light weight compared to larger cart bags, which can weigh around pounds. Although this bag is a little heavier than the Sunday carry bags listed below, this golf bag is a great mix of storage space and comfort. 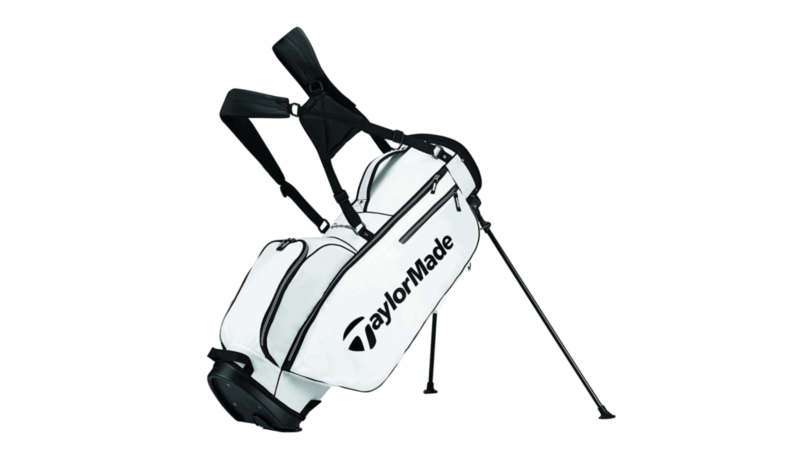 If you aren’t really sure what type of golf bag you need, the TaylorMade 2017 TM Stand Golf Bag 5.0 is a solid pick. It is great for walking OR riding, so don’t think you need a cart bag just because you usually ride in a cart. If you solely ride when you play (I am so jealous), you might want to look into a cart bag. That way, you can keep everyething you need in your bag, not having to trade things out in your trunk depending on what you need like I do. 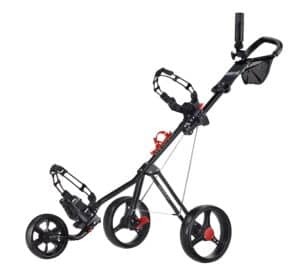 Because you are only going to be carrying your bag from the pro shop to the cart and vice versa, you won’t mind having more items weight your bag down just in case you might need them. If you haven’t heard of Sun Mountain, they are basically the best golf bag brand in the industry. They are known for extremely well made bags that will be reliable and last you decades. Remember, a more expensive one time purchase is much better than 3 cheaper purchases. The Sun Mountain 2018 C-130 Golf Cart Bag comes in many great designs. I am a sucker for the red, white, and blue USA one, but that’s just me. This bag is only about 7 lbs, so a little heavier than the stand bag above, but not by too much. If I was only riding when I played, this is what I would get, so that I can carry everything that I need with me and keep my car looking a little cleaner! I am shocked that more recreational golfers don’t use Sunday carry bags. Heck, you might have never even seen one besides Happy Gilmore’s! I first time I saw one, I asked if I could try it out, and I instantly fell in love. If you really think about it, you don’t need to carry that much stuff with you. Some golf balls, a glove or two, a towel (that clips to your bag), a rain case, some tees, a place to keep your (alcoholic) drink(s). That’s really about it. There is no need for a large bag unless you NEED to keep more things in it. There are two problem with a Sunday golf bag. But, if they don’t bother you, then it is THE bag for you! The first problem is that you can’t fit all of your clubs into some of them. I typically take out my 9, 7, and 5 irons and keep everything else. It makes golf a little more fun for me personally, having hit a more knock down shots. I think my control has improved overall after taking our three irons, but your results may vary. The second problem with the bag that I tried out was that it wasn’t a stand bag. I had to lay it down and pick it back up for every shot. The super light weight was a huge benefit, but it didn’t cover this inconvenience. However, after doing some reserach, there is a bag that is both a Sunday bag and a stand bag! That is why I now use the Orlimar Carry Bag when I am just walking and not in a competitive round (where I would need more items just in case). It’s incredibly light, super convenient, and it is also a great talking point when meeting new golfers. I have even converted a couple of friends to the carry bag life, and they (and their backs) have thanked me! So, I encourage you to pause and take a second to determine how many things you REALLY need to carry with you when you play golf. If you can’t think of too many things, consider getting a carry bag. If you need to carry a change of clothes (in case of a reeeeeeeeeeeally bad golf shot), lots of extra items, and/or don’t want a carry bag, consider the two options listed above. 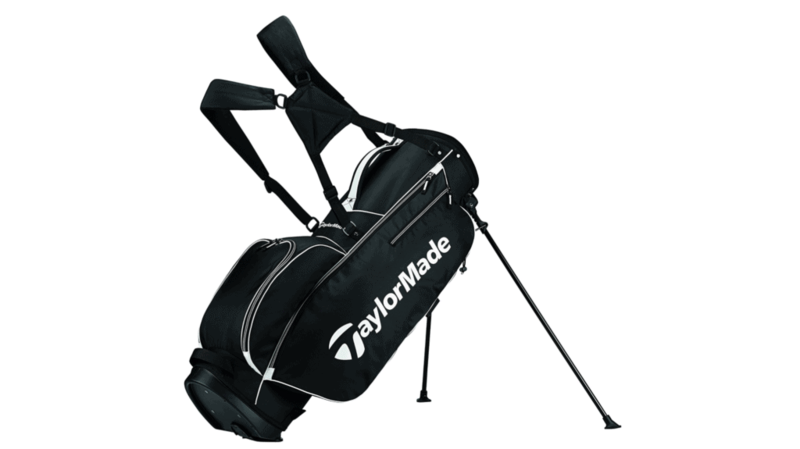 If you are looking for the best value golf bag that your hard earned money can buy, I would stick with the TaylorMade Golf 2017 TM Stand Golf Bag 5.0. For around $100, you can get a bag that is fine for walking or riding. A bag that can hold just about anything you will need. A bag that comes in many different colors so you know you can find one that fits your eye. A bag that you won’t feel guilty about after shelling out the money. A bag that will last you for years and years without breaking. Alright, enough out of me. I think you get the point. Heck, if you buy the golf bag and aren’t happy with it, I want you to email me… I won’t be able to do anything about it, but no one ever emails me so my inbox is getting kinda lonely! If you are a sports fan, I can almost guarantee there is a golf bag that has your team on it. So show your support if you are a true fan. There are bags for NCAA teams (the most common), basketball teams, football teams, hockey teams, soccer teams, badminton teams (OK maybe not those), etc. There will be two options that you should consider: the NCAA Fairway Golf Stand Bag or the NCAA Victory Cart Golf Bag. I’m more of a fan of the stand bag, as it is fine for walking and riding. And don’t forget, there are tons of NCAA sponsored golf items that you can buy. Towels, tees, hats, head covers, you name it. I wouldn’t suggest gouging your whole bag with one team’s logo, but I know many guys that do! 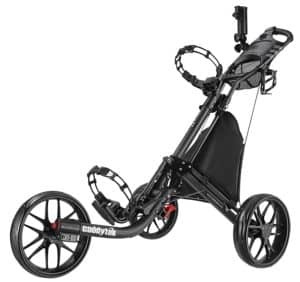 As an extra bonus, for those that like to walk buy don’t want to carry their bags, I have picked out the two best golf push carts that you can buy. One is the best one overall, and one is the best golf push cart on a budget. Both comes from the CaddyTek brand, the absolute leader in the industry for golf push carts. They are not too different, with the best overall just having more departments for storage and collapsing a little more simply to put in the car. However, for the price difference, I would personally buy the best on a budget SuperLite Deluxe version. This push cart is the absolute best match for your new golf bag. This is CaddyTek’s premium model, with all the bows and whistles. It has many more compartments for items than the budget version, but it does obviously cost a little more. It is also a little more convenient to collapse and put in your car, due to the construction of the cart. If you are on a tighter budget, or just like getting the most for your money, I would stick with this SuperLite model. It is also very easy to fold and store in your car, and has adequate storage for most everyone. If you travel a lot and bring your clubs (for business, wink wink), then you know how much your clubs are in danger at the airport. If you don’t already have a good travel case for your bag, I would 100% think about investing in one. If you think about it this way, you would always want to spend $50-75 to protect a (potentially) $1000 investment, right? 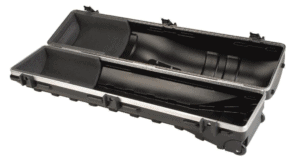 If you want to go the cheaper route, you can buy this Izzo Soft Shell Golf Bag Travel Case. As long as you pack it tightly with LOTS of towels or other soft materials, you should fine fine. For added protection, I would highly recommend this club protector, which basically is a hard shell for the top of your bag to protect the club heads specifically. The CaddyDaddy Co-Pilot Pro II Hybrid Travel Bag is a product that is perfect for those that travel with their clubs extremely often. Why buy a shell case when your bag can act as the case as well? Just put over the included cover for the top of the bag, and BOOM! 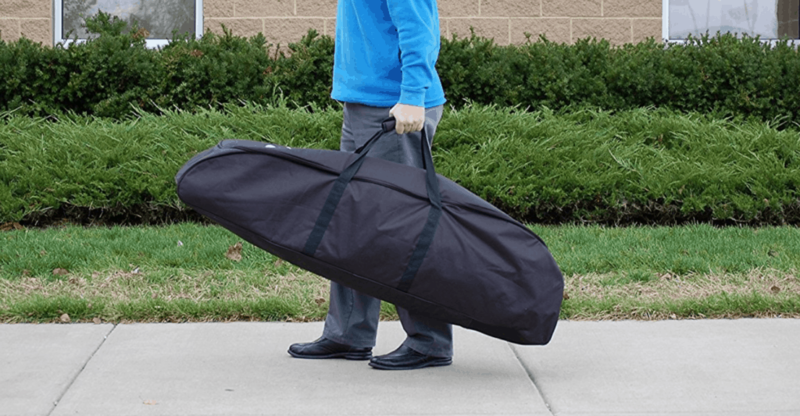 You now have a golf travel bag that is ready for the airport.